A most pleasant end of terrace THREE STOREY TOWNHOUSE in a small select development on the edge of Pittville Park and with the benefit of a larger than average plot, garage and ample parking. The accommodation with lots of improvements comprises: large entrance hall with spiral stairs to all floors, kitchen / dining room, conservatory, door to garage and cloakroom with WC. On the first floor is living room with windows to front, one double bedrooms (with en suite bathroom and door to balcony overlooking the c. south facing rear garden and bathroom. 2nd floor has three further bedrooms and bathroom. The Situation: Only ¾ mile or so from Town, Pittville Lawn offers accessibility to the Town Centre and a “stones throw” from the Historic Grade II listed Pittville Park which boasts lakes including a delightful boating and fishing lake, children’s play area and aviaries, tennis courts, skate park and a pitch and putt golf course. Directions: Leave Cheltenham Town Centre (inner ring road) via Portland Street and Evesham Road (A435). Pass the second set of traffic lights (junction with Clarence Road) and turn right at the third set into Wellington Road then take the first exit into Albert Road (sharp left) at the roundabout; proceed straight ahead and take the second exit left into Pittville Lawn, finding No. 99 in the small development early on the left hand side (No. 99 being the far right hand property). Front entrance door, with panelled double glazed windows either side, spiral stairs to all floors, double glazed windows to side and radiator. Double glazed window to rear, patio doors to conservatory, door to integral garage & cloakroom with w.c. Range of base & wall units with work surfacing. Built in oven, microwave and electric hob, wall mounted Worcester boiler, space and plumbing for washing machine, space for fridge freezer, single drainer sink unit with mixer tap over, two storage cupboards housing, radiator, tiled splashbacks and floor. Door from dining area of kitchen into garage with light and power. Door from integral garage, white suite of wash hand basin, macrating WC and heated towel rail. Accessed via the patio doors from Kitchen/Dining Room, tiled floor, double glazed and french style doors (with cat flap) into rear garden. Accessed by spiral stairs, radiator. Two double glazed windows to the front with views over Pittville Park, radiator. Double glazed window and door to balcony overlooking rear garden, built in double wardrobe and radiator. Double glazed obscure window to rear, white suite comprising panelled bath with mains shower over, wash hand basin and W.C. fully tiled and radiator. Accessed by spiral stairs and storage cupboard. Double glazed window to fron, built in double wardrobe and radiator. Double glazed obscure window to rear, white suite comprising panelled bath with mains shower over, wash hand basin and W.C., fully tiled and heated towel rail. Double glazed window to rear, radiator and built in double wardrobe. (Rear) Established c. south facing rear garden with lawn area, trees, shrubs and borders. There is a side gravelled gated pedestrian access to the front, patio area outside door from conservatory and shed. (Front) To the front is a parking space in front of the garage and additional parking area adjacent. 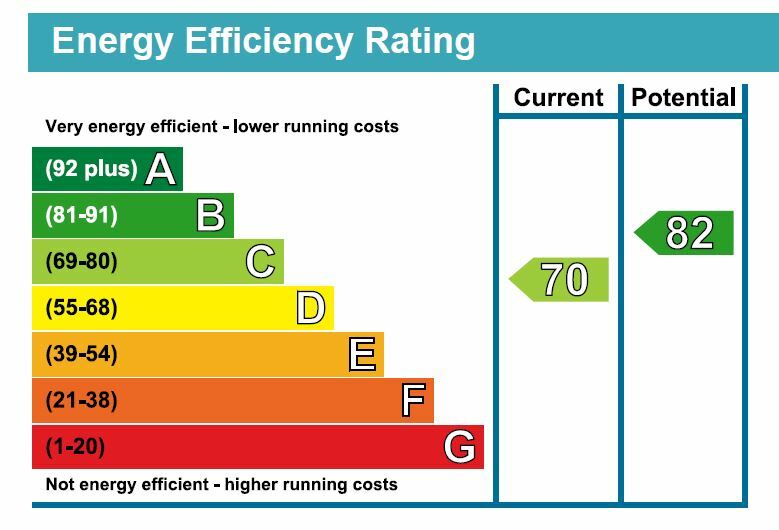 We are informed by Cheltenham Borough Council that the property is in Band ‘E’ with £2,030.97 being payable for 2018/2019. 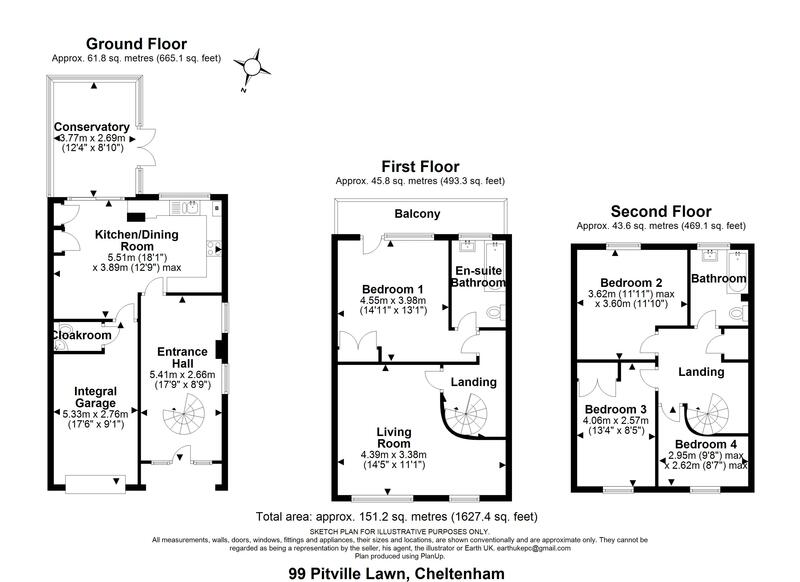 FLOOR PLAN AND EPC TO BE ADDED ON THURSDAY 6TH DECEMBER.